So… Shopping day. I’m at the point where I’m finding I don’t really need more supplies to do any craft I feel like, so I’ve been leaning towards buying things I can decorate… Like boxes or cat shaped money boxes. 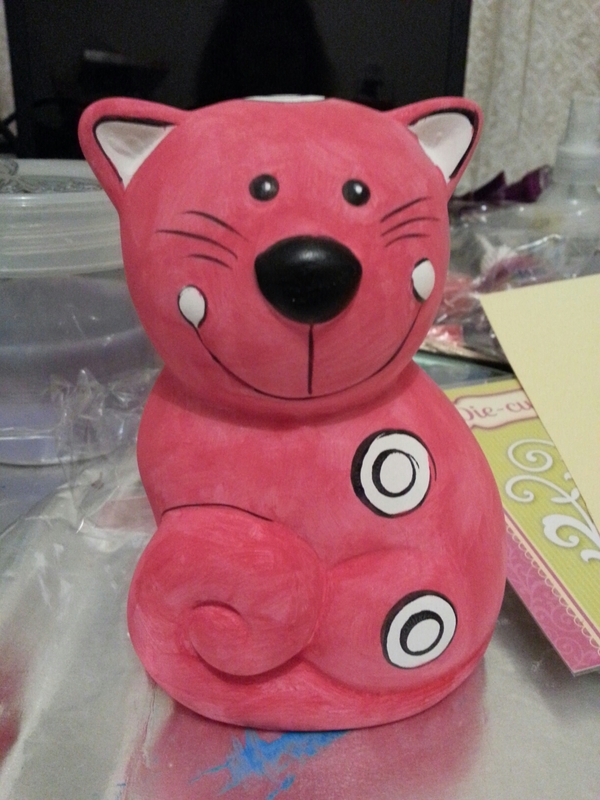 This cat came in a kids kit with watered down acrylics and a teeny paint brush, which I ended up using. Probably took an hour to slowly paint him red but it was fun. It wasn’t as relaxing as painting boxes- probably because I had to avoid areas and the brush and paint didn’t flow very nicely. He’ll need more coats and I have no idea what other colours I want. I didn’t even know he was going to be red until I got him out to paint. I bought a magazine today, which had a die cutting plate come with it. I’m unsure if I used it wrong, but the paper was pushed so hard into the grooves that it tore trying to get it out! I guess I need to play around with it. I hope I get it to work, as it’s a lovely flourish, which I have been looking for. Today I sat at my desk for a short time, looking to do something crafty before my nap. I finished off painting a box that I had started yesterday. Painting boxes with flat colour is the thing that calms me most. I was enjoying this feeling so much, but I ran out of paper and wooden boxes to paint. 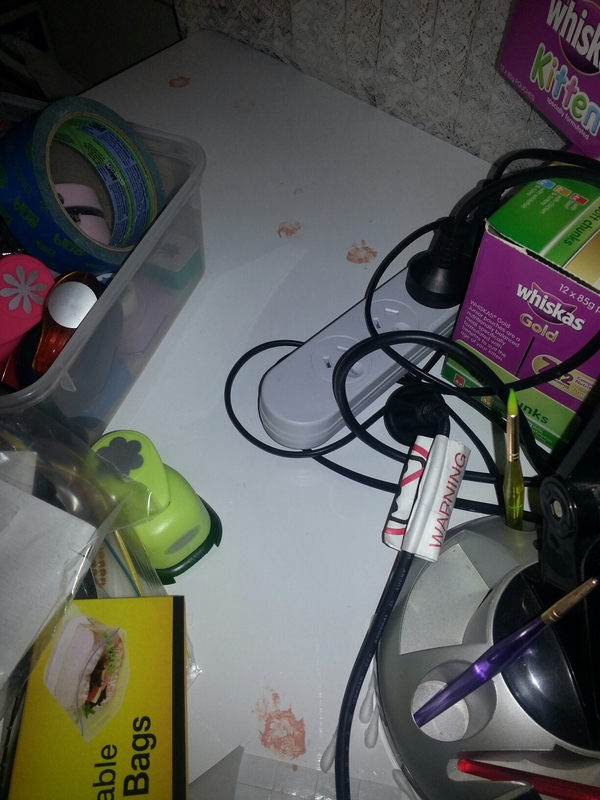 I looked around my table and found a biscuit tin that I recently emptied. I love my butter cookies at Christmas, and have multiple tins around the place, so I thought I could guesso and paint them to look nicer and give me something to paint. In between coating the tin and thinking about how many coats would cover the pattern, I somehow came up with the idea of a modified paper mache. Using tissues, separated into one layer and torn into pieces, I used the gesso as the binding agent. It worked really nicely in covering the tin, it stuck brilliantly and only used one tissue for the entire top. I was quite excited at this discovery that I decided to see how it would make vessels. 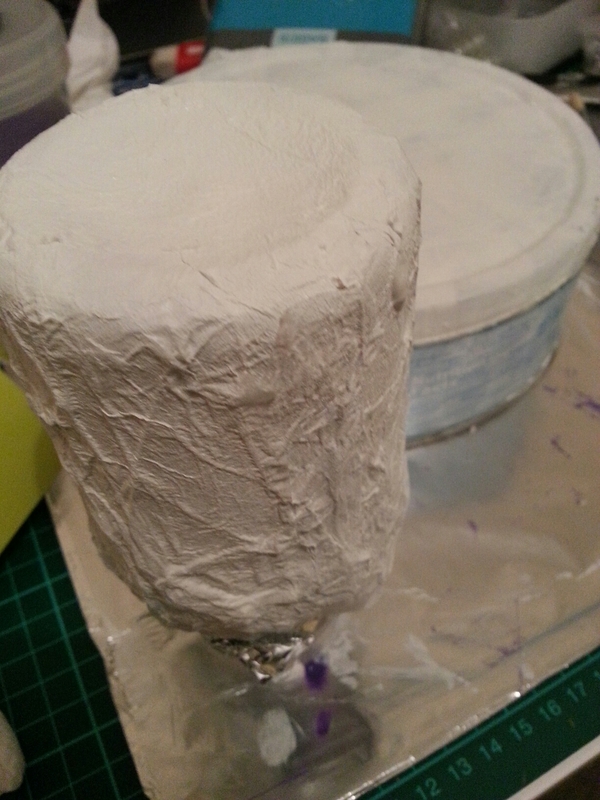 Using tissue or paper towel in paper mache seems to make it more flexible, but I’m wondering what the stiff guesso will do to the structure. If this works well, I have a way to make paper containers to paint instead of buying so many, as well as an option for armour in cosplay. Even just using this method in the top layer of your piece will help smooth and give a great even base, with no newsprint, ready to paint. I’ve been playing around with clay and silicone moulds recently. I started by trying air drying clay (non toxic thankfully for the cats.) It was kind of ok but looked a bit crumbly so I tried a slip cast. I’d only done it with kiln-clay previously so wasn’t sure if it would work the same. It’s still drying three days later, maybe due to cold weather or the amount of moisture in it, even thought they were small cavities. I got out my super Sculpey and began making a miniature figure. Every time I try to do this, I get so frustrated and give up for a while, but thought I hadn’t tried with the super Sculpey yet, which is meant to be firmer than the normal tiny packets. I also learned that I could bake the figure in stages, so I don’t ruin bits I’ve finished while working, which is my biggest problem. I painted half a box purple and tried putting glossy accents in a vial to see if it dries clear in big areas as I couldn’t find the result online. Other than that, I’ve been thinking about cosplaying. I’m sure to let you in on the details once I decide some things. 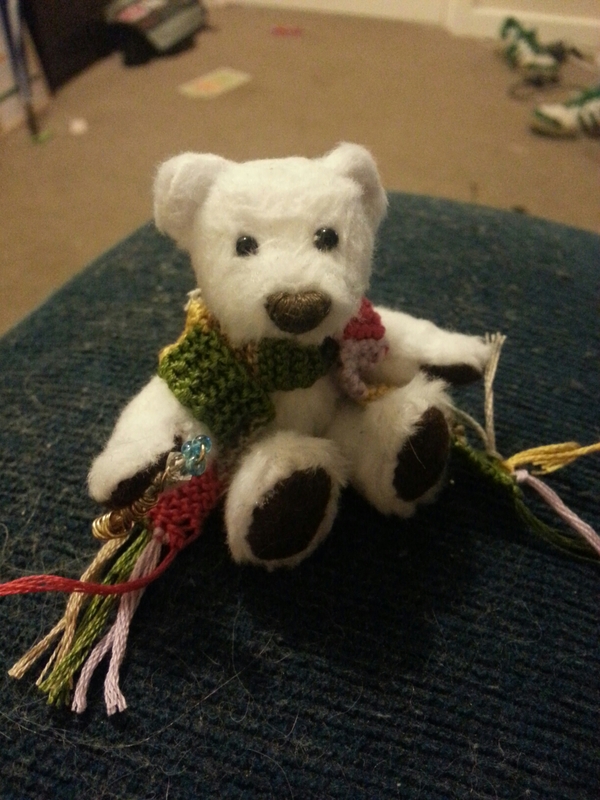 Because the WordPress app only lets one photo per post, here is a picture of the Dr Who bear with scarf. I used embroidery thread and I think 1.5mm kneedles (knitting needles). With 5 stitches, I garter stitched, switching colours randomly until it was long enough. I added a couple of tassles and stitched it to itself at the back, so it wouldn’t come off. I also made him a little fez, but it looks weird and I didn’t photograph it. I really need to set up a photo booth for my crafts. Much to research before selling, too. Found some time to get my tablet out to draw tonight. 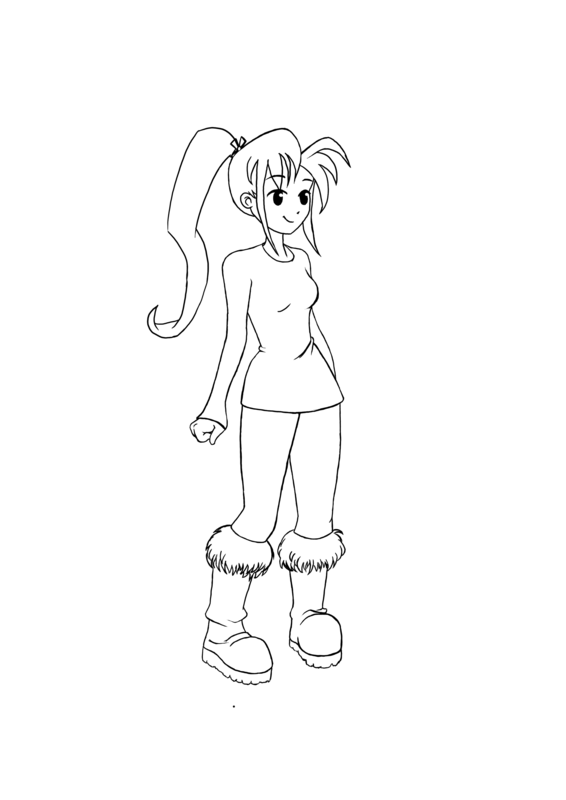 This is a picture from Mark Crilley’s Mastering Manga 1 book. I sketched her loosely based on the picture in the book, then refined by myself for practice. I know I have the skills and talent to create figures and comics, but for some reason it doesn’t turn out how I’d like. My poses are too static, recreating the same character and getting characters to interact and look like they haven’t just been photoshopped into the same picture, is some of my problems. At least I know what I need to practice. I really need to add to my DeviantART gallery, but I need something original that I’m proud of. Then maybe I can move into shirt designs and things. I suppose I’m my greatest critic. Cards for the brothers. My partner is in love with his phone, so I made him a phone card. His brother is turning 21 so I tried a blackjack theme. Not sure that it’s finished but I don’t know what it needs. I half finished my dad’s card. It’s my first attempt at a shaker card, so hoping it goes well. After stacking 24 circles of card twice to make the walls the rest should be ok. Apart from both the heat embossing and watercolours warping the paper. Hopefully I can get it to flatten. Perhaps a pass though my big shot will help. I made a bear today. I’ve made quite a few bears in the past, so I think I’ve gotten pretty good at it. They are so cute but I find that I don’t make many at a time, as they are fiddly. I have a few themes in mind, including a mermaid bear to try, but this one was for my brother in laws 21st birthday present. 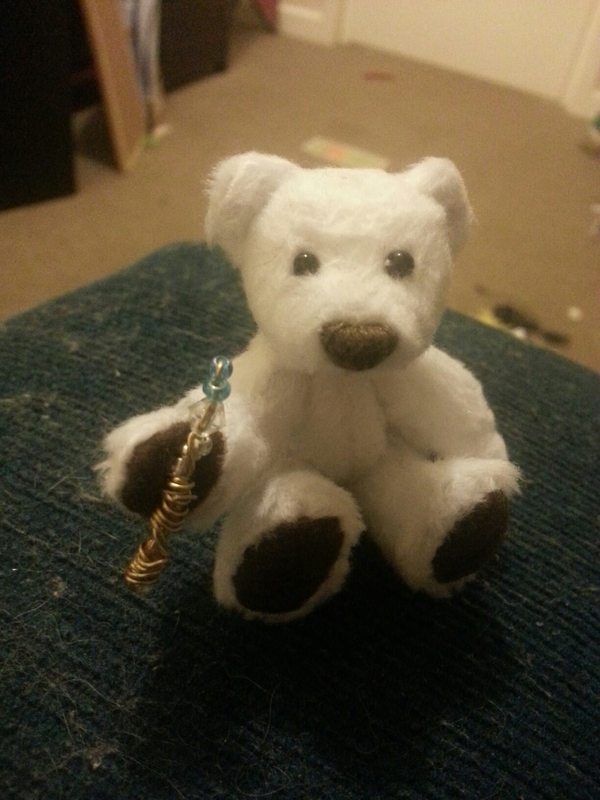 He’s obsessed with Dr Who, so I’m going to knit a little scarf for the bear and he has a sonic screwdriver. I’m also painting a box to look like a Tardis for the bear. It’ll be bear-grr on the inside… Hehehe. This is an engagement card for some friends. Usually when I do wedding type cards, I match the colours that were on the invitation, which usually mirror the theme. This time it was black white and silver. 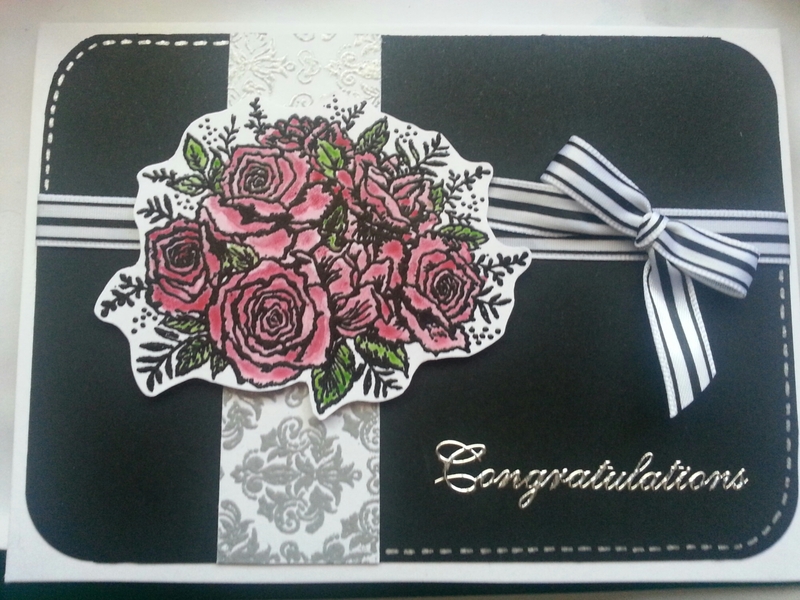 The rose image was black heat embossed then coloured using watercolour resist. The damask strip was silver heat embossed and the sentiment is a sticker. I tried heat embossing a stamp, but the powder didn’t get all the details, and kind of melted into the paper. Maybe my straightener was too hot… Yeh, I should really get a heat gun, but I’m not good with hot things. I quite like the look of the fake stitching on only two of the corners. Funny how making cards is easier than making up what to write inside. You would think with so many events needing cards coming up, that I would works towards that. Guess not. These two cards were produced tonight. 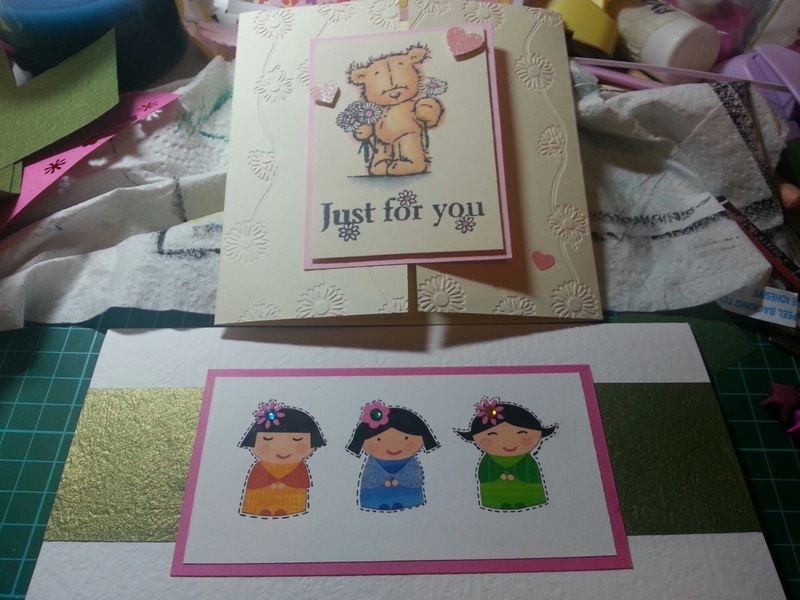 The teddy one, thanks to a card making magazine, which came with an embossing folder and stamp. I coloured the bear with copics, and because it’s just regular card, bled outside the lines. I went over it with pink so it’s slightly less noticeable and I went over the flowers in cream matching the card base. I was going to colour him in grey with a blue nose, but that would seem like copying the “me to you” brand, and ended up liking these colours anyway. The second card is made using little girls cut out of wrapping paper. I really wanted to have some patterned paper behind them, but when I cut and glued the paper down, it didn’t fit on the card, so I ended up getting a larger card base, and found some green shiny paper that I wanted to incorporate somehow. Remember: wrapping paper is patterned paper too. 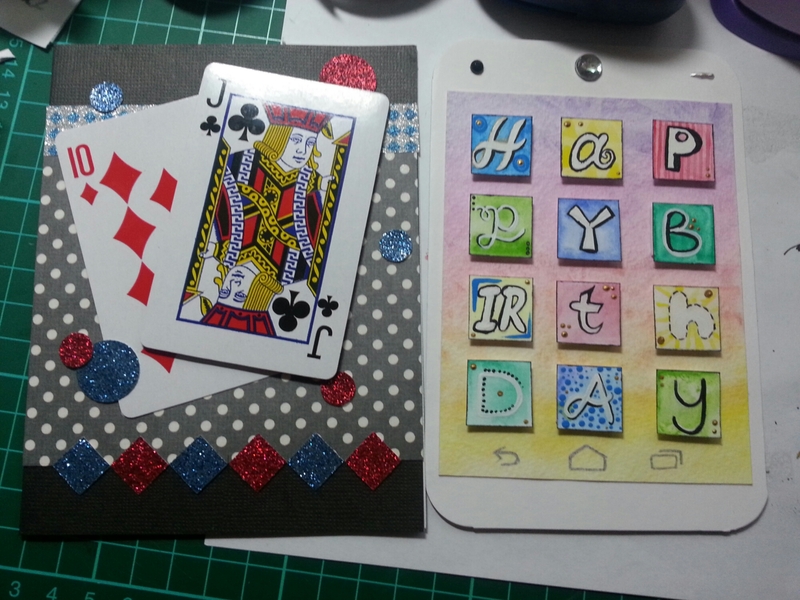 There are hundreds of designs, you can coordinate the card and present, it can be fairly cheap and you get heaps of it. If its too thin, stick it to card and cut out patterns. Repeated patterns are brilliant for paper tole cards and you can build up a collection and not worry about last minute lack of wrapping paper!